The ability of GIS software to manage spatial data and provide analytical capabilities makes it a viable 2D spatial planning tool for particular planning scales. A diagram I developed to work out how GIS data moves between sources, databases, analysis models, the design process, and reporting tools. It gets complicated quickly. A standardized data model containing the types of data planners and designers typically rely upon can be tapped to create useful information that informs the design process. Here, the permitted envelopes of existing zoning districts are shown in 3D. This was achieved en-masse using a custom parametric rule set in Esri CityEngine, which ingested lot coverage, FAR, setback, and height requirements for each to identify a maximum 'as-of-right' building allowance on individual parcels (O2 Planning + Design). While direct architectural or urban design may not be within the legal purview of a municipal planning project, visualizations of potential designed outcomes are still incredibly useful for informing discussion. Parametric modelling tools, supported by a design 'data model', provide the potential to turn 2D plans into 3D visualizations with relative ease. Much of my time as an urban designer and planner was focused on working to integrate 3D visualization, spatial modeling and analysis, and databases in GIS to support more effective and efficient physical planning and design across scales. This kind of approach to work in that field has with increasing frequency been called GeoDesign. This buzzword has a number of evolving definitions (and interpretations and critiques). 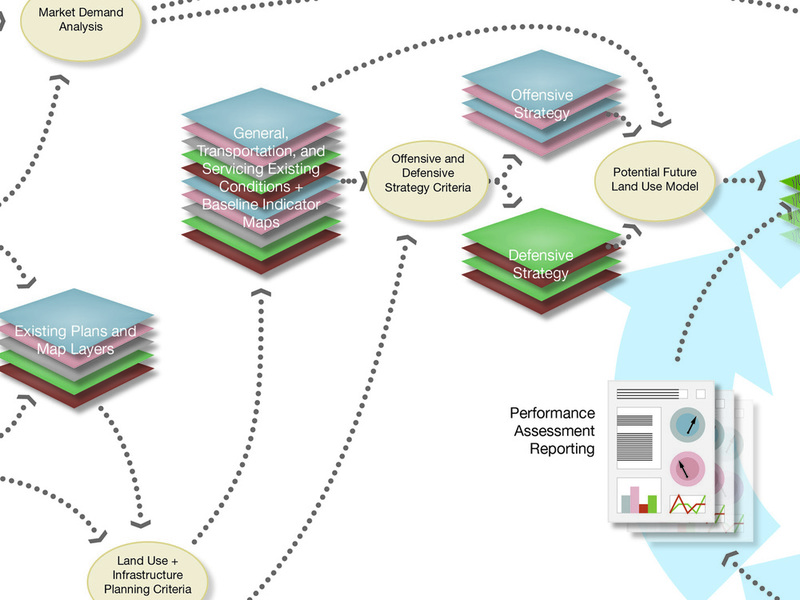 GeoDesign is a design and planning method which tightly couples the creation of design proposals with impact simulation informed by geographic contexts, systems thinking, and digital technologies. As it relates to urban design and planning, I see GeoDesign as an important way to bridge the gap between a traditional design workflow (which is a decision-making process in a geographic space) with the necessarily data-, function-, and model-oriented nature of software application architecture. It provides a way to conceptually translate the components of the design process--the sketches and diagrams--into discrete data objects within a standardized model. When design is undertaken in this way within a system where other pieces of standardized geographic information and spatial analysis tools can be pulled in (i.e., in GIS software), the performance and impacts of design proposals can be better understood and iterated far more quickly than in a traditional design workflow. The repetitive tasks associated with communicating conceptual design ideas (e.g., data aggregation, plan rendering, and performance reporting) are handled in the background. Design criteria, iterations, and relational concepts are stored in appropriate, spatially-enabled data structures. Decision-making criteria, captured quantitatively and/or spatially, are more effectively used to inform initial design decisions and then to assess the performance of design proposals. Me, at left, working with Bill Souter, right, to translate O2 Planning + Design's ecological urbanism design workflow into one optimized by the capabilities of available ESRI software and aligned with the Steinitz GeoDesign framework. Redlands, CA, November 2011. While at O2 Planning + Design, I worked on a project in partnership with ESRI to create a pilot technical workflow demonstrating how GeoDesign might be used in urban design and planning projects (featured at the 2012 GeoDesign Summit). Subsequently I applied the GeoDesign approach successfully to several projects highlighted here. For my work at O2, I used a combination of ESRI's ArcGIS and CityEngine parametric modeling software, supported by a custom Python package I developed to handle design sketch data management, spatial analysis, and design performance reporting. I think the most exciting aspect of GeoDesign is in the opportunity to represent some of the often nebulous and difficult-to-bound concepts like "connectivity" and "sense of place" that are prominent in the the way [urban design/landscape architecture/architecture] describes optimization and success. These concepts are loose and fluid by nature, but that makes them difficult to represent on a map; it's hard to track how changing those things might improve the overall state of a place. The idea of GeoDesign, I think, offers some guidance in how we might translate those types of ideas into models that we can then manipulate over in space and over time. A potential, tangible outcome from that translation might be how ideas about space and place are represented; for example: a traditional urban design product might use 3D model-based renderings to show what a "connected place"looks like; but I think this might be better represented and communicated with a spatial-temporal data visualization, derived from design sketches of what could be.